Desert Power Plant from the Desert Walk Series illustrates the destruction of the land and our survival during climate change with drawings of skeletons and a human embryo. The photograph was taken in front of a coal power plant in the sacred land of Navajo Nation where some natives deliberately choose not to use electricity in order to preserve the land. The sharp contrast between the efforts of preservation and destruction of land in this area is not a mere local issue. It asks the question of our future survival depending on our action resulting in consequences on a global scale. 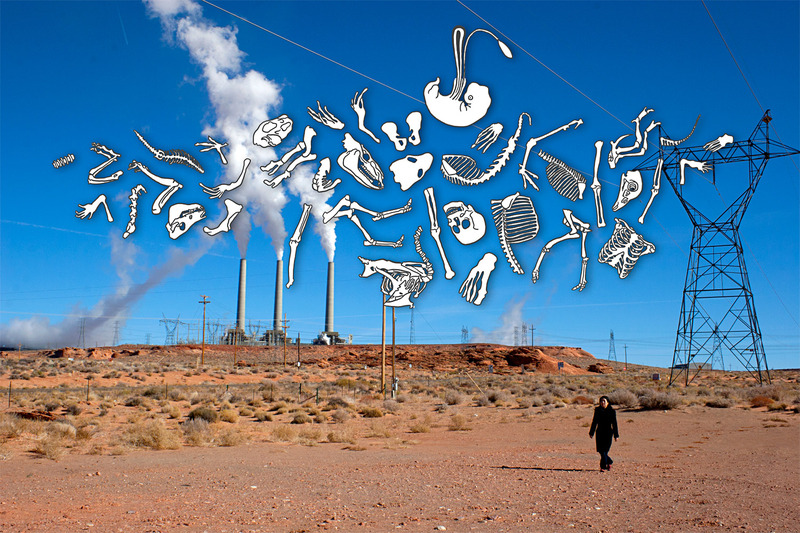 Superimposed digital drawings of animal skeletons and a human embryo over the image of the artist walking in front of a coal power plant in the sacred land of Navajo Nation. Photo taken in Navajo Nation, Arizona.